In February 2008 my band and I were invited to perform at the Australian Blues Music Festival in Goulburn NSW. Part of the package we wereoffered included accommodation and, as fate would have it, my own room at the motel was next door to Central Coast-based keyboardist, Parris McLeod and his beautiful wife, Wu Pu-Yu. Parris co-owns Cloud Recording Studios at Wyong and had recently produced, played on and co-wrote seven out of the ten tracks on what is a superb first release by one of the most wonderful, exciting and powerful vocalists that I have heard in a very long time - Gail PAGE. That album, COLOURS THAT RUN, was to figure one way one or another in six out of the seven available categories for the 'CHAIN Australian Blues Music Awards' and won three of those. More as we progress. 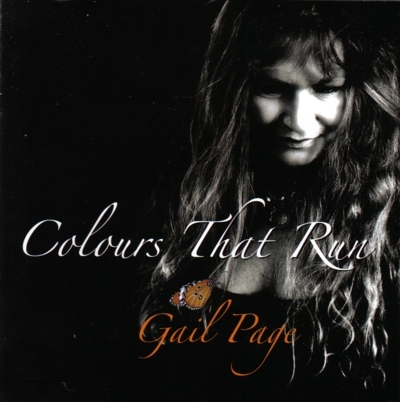 While I could not consider Gail as a 'Blues Singer' per se, mind you she can cut the genre to pieces with great ease, she is so damned soulful that it makes no difference and she is well at home appearing at a 'Blues Festival'. far more so than some of the acts that have been touted as headliners at many of the 'Blues Festivals' around the country in recent years. From the opening strains of Without You Here you realise just how special she is. This beautiful and soulful ballad just makes you want more and is a perfect opener for what follows. Next up is Stay which starts off sweetly and tenderly and builds to almost crescendic proportions showing the full stretch this wonderful singer has on tap. This followed by Through The Fire for which Gail was awarded the 'CHAIN' for Female Vocalist of the Year. Personally, I would have given it to her for any of them - she's that good. Next we have the potentially autobiographical Listening To Me and as Gail sings, "I'm no longer in possession, I made my own decision!" Then we boogie to Shape I'm In which gave her the award for New Talent of the Year and shows her in 'blues mode' for what is possibly the only time on the album. You Can Hear It sounds to me very much like a 'groove' thing that the band happened on in the studio and is very spontaneous in its sound and approach. Tonight is yet another of those beautiful and very soulful ballads of loss that Gail sings so well. From here we go to the final three songs on the album. Those written by Bill White and Nicol Walkem - Gecko Moon, Second Chances and So Scared. All appear to have very strong Koori connections in many more ways than the sounds of Mark Atkins' didgeridoo on Gecko Moon. Second Chances seems to be an ode to a mother who was part of the 'Stolen Generation'. Perhaps former PM John Howard should listen to it and take note of the sentiment expressed. Gail takes So Scared and makes it very much her own to finish off what is a truly superb album. As I said earlier, three awards were bestowed on what, for me at least, has become a favourite album. Two of these I've already mentioned earlier, but the third is also most deserving because Parris McLeod picked up the gong for Producer of the Year and he did, it must be said, a great job. Apart from Gail (lead vocals) and Parris (piano/Hammond organ) the remainder of the band reads like a who's who of Aussie Blues, Jazz and Rock musics. We have Gordon Rytmeister (drums) who has played with the legendary Don Burrows among others, Leon Gaer (bass) a fixture at the Professional Musicians Club in Sydney for many years, David Longo (guitar/'Dobro'), Tessa Nuku (backing vocals), Peter Collins (harmonica), Malcolm Eastick (guitar) a true legend of Aussie Rock and Blues and the previously named Mark Atkins (didgeridoo) who is also a member of Parris and Pu-Yu's 'The Reason To Believe' band who play music of a very different flavour venturing into Folk, Classical and Jazz areas. Is the album worth buying? In my own opinion for what it's worth - most definitely. Whether you're a fan of Blues or not doesn't even enter the equation. Gail is a truly great singer in anybody's language and deserves to be heard by everyone at every opportunity that arises.